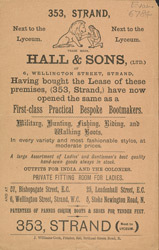 For most of the 19th century the upper and middle classes, had their boots and shoes made by a bespoke shoemaker like the one advertised on this leaflet. The working classes on the other hand bought their shoes ready made from a general clothiers shop. A bespoke shoemaker had individual lasts (the feet shaped blocks used to mould shoes), for each of his customers and would make shoes to order, from leather, in one of a number of different designs.